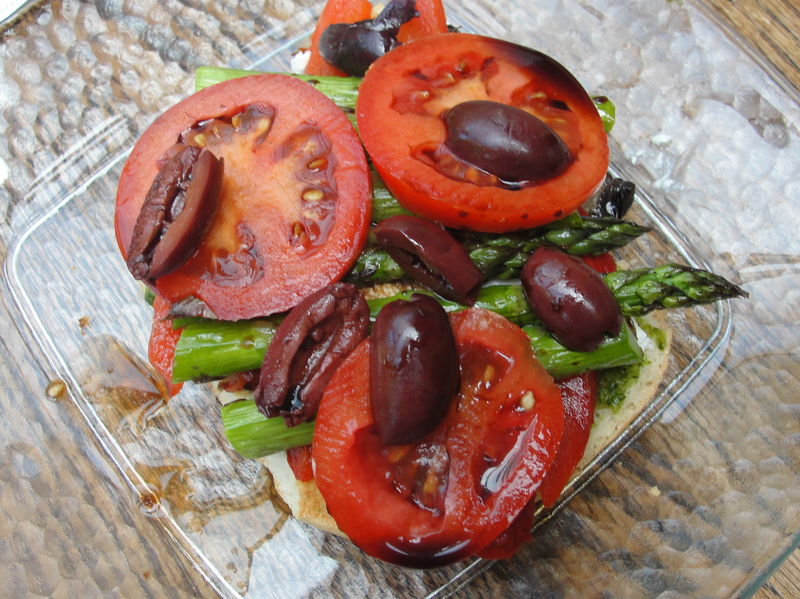 One of my favorite lunchtime meals has to be an herb grilled veggie sandwich. There is absolutely nothing as savory as thyme marinated Portobello mushrooms, with grilled eggplant and zucchini, sliced heirloom tomatoes, parmesan roasted asparagus, and kalamata olives with basil pesto and balsamic vinegar on a crunchy ciabatta roll!! I really like to load on the veggies, so I tend to eat mine open-face with a fork and a knife (as you can see in my photo!). And feel free to add any cheese of your choice, because obviously everything is better with some gooey melted cheese on it! I like to use goat cheese, sliced fresh mozzarella, or Provolone, but any cheese will do. I recommend putting your cheese on the bread and then putting it in the oven for a bit so that the bread toasts and the cheese melts! The easiest way to prepare the veggies for this sandwich is to combine the eggplant, zucchini, and asparagus in a bowl and rub with olive oil to cover. Then put them into a grill basket and place them on the grill for about 10 minutes, mixing them around frequently (I usually toss in some sliced Spanish onion as well, which caramelizes nicely). Once the veggies are cooked, sprinkle with some kosher salt and set aside. For the Portobello mushrooms, begin by making the marinade. Whisk together about ¼ cup of extra virgin olive oil, 3 tablespoons of balsamic vinegar, 3 cloves of minced garlic, and a teaspoon of fresh minced thyme leaves in a small bowl. Then clean down the mushrooms with a damp paper towel, and remove stems. **TIP: To clean mushrooms, wipe down the caps with damp paper towel, never emerge the mushroom under water because they absorb the liquid and do not cook the same. Once the mushrooms are clean, use a silicon brush to apply the marinade to both the tops and bottoms of the caps. Place them directly on the grill, cooking on each side for about 4 minutes. Once removed from heat, slice down into thin strips or leave whole, depending on your preference. I like to cut my veggies down into strips so that they lay nicely on the sandwich and so that every bite has a little piece of everything and tastes uniform. Then drizzle some pesto over the top and a little balsamic vinegar and then your ready to eat!! Also, roasted red peppers make a delicious addition to this sandwich and I realize that not many people know how to make them so I will take this moment to describe the process, which is easier than most people think. If using grill: Take about 3 large red bell peppers and rub with olive oil using your hands. Coat the entire pepper and set on grill that has been heating up for a while. Turn the pepper as the skin becomes charred until the entire pepper is black. Takes about 15 minutes total. If using oven: Take about 3 large red bell peppers and rub with olive oil using your hands. Coat the entire pepper and set on baking sheet covered in foil. Turn the broiler of your oven on high and allow to heat up for a few minutes. Then place the peppers into the oven on the highest rack. As the pepper skin turns black from the heat, turn to next side using tongs until the entire pepper is black. Takes about 15 minutes total. Once you have your blackened peppers, place them into a glass bowl and cover with plastic wrap. Allow the peppers to sit for 5-10 minutes to cool, before removing the charred skin with your fingers. Gently tear the skin off and remove the core and seeds of the pepper, as they are bitter. Then throw away the skins and place the “meat” of the pepper back into the bowl. Drizzle with olive oil, sprinkle with kosher salt, and add 5-6 cloves of smashed garlic for flavor. These will last in your fridge for about 2 weeks! ***When making these peppers DO NOT be afraid of the pepper turning black. It is NOT burning!!! It needs to turn black and charred so that the skins can be removed easily!! !